With advice from experts, plastic producers and machinery manufacturers, James Rickard compiles top ten tips for round bale wrapping. Good wrapping techniques start with baling – a badly shaped round bale cannot be wrapped properly, says Claas baler specialist Ian Brydson. He says bales should be dense and cylindrical in shape, not bulging in the middle or conical shaped, and to achieve this crop flow is key – starting with the swath. Developments in baler technology have also made a big difference. “Roller crop presses and intake rotors, which force material into the chamber, really help with bale density. Dr David Davies, a director at Silage Solutions, says higher bale density can also be achieved with chopping. “Chopped bales are at least 10 per cent heavier than their unchopped counterparts helping to reduce the cost of production. To prevent downtime and inefficient use of plastic, several pre-season and in-season checks can be made. All moving parts are free, in particular the Pre Stretch Unit (PSU) which can cease or stiffen up out of season. Check PSU and turntable gearing for wear and tear. Check PSU rollers for any damage and thoroughly clean down with de-greaser. Check PSU springs and replace if necessary. Dosed springs, dirty or worn-out rollers will cause aquaplaning, film tearing and uneven film application. The correct amount of film stretch can be measured (see diagram A), and adjusted if necessary, by wrapping a straw bale before the season starts, says Mr Dawson. To do this, make two marks horizontally on the film reel 100mm apart. Slowly commence wrapping and locate these marks on the bale surface and measure the distance between them. For example, for 70 per cent stretch, the marks should be 170mm apart (see diagram B). Film wrap manufacturer Silotite says film overlap should be no less than 50 per cent. To achieve this, check that when on the wrapper, the centre of the bale is horizontally in-line with the centre of the film reel (see diagram C). Wear and tear of all belts should be checked and even if only one of them is damaged or worn they should be replaced. Silotite says badly aligned and worn belts will affect overlap. 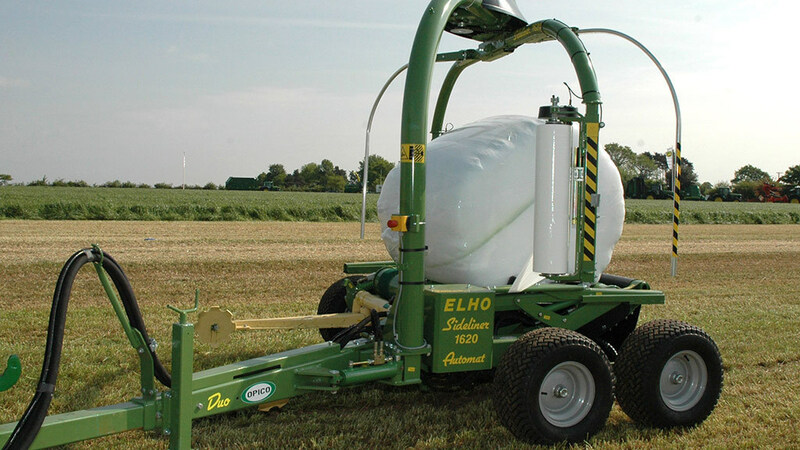 Ensure a minimum of four layers is applied to bales with up to 50 per cent dry matter, and at least six layers for those over 50 per cent dry matter and coarse crop natured bales, says Silotite. A recent experiment, undertaken by the Institute of Grassland and Environmental Research, demonstrated using six layers instead of four improved fermentation, created a better oxygen barrier and reduced moulds and dry matter losses. However, it also revealed eight layers to be excessive. The extra cost was calculated at £0.71 per bale for six layers and £1.43 for eight layers. The cost saving in terms of the extra dry matter and sugar recovered was calculated at £1.37 and £2.52 respectively. In return on cost terms, six layers gives 92 per cent but eight layers achieves only 76 per cent. Wrap at the stacking area if possible, but if not, move bales from the field immediately after wrapping. Mr Brydson says due to baler and wrapper developments, many farmers and contractors often wrap in-field. Dr Davies adds while most will be aware of the importance of not damaging the wrap, many will be unaware of the potential problems of incorrect bale handling. He says: “Even when using a squeezer, oxygen will enter a bale every time it is handled. This is because as the grab squeezes the bale to lift it, the gasses inside the wrap are pushed out. Once the bale is released, air from outside is sucked back in to fill the vacuum left behind. Wrapping at the stack is considered the best option, says Dr Davies. However, this method is not without its own problems. “Often unwrapped silage bales are moved to the stack by spiking, greatly increasing the risk of oxygen-related problems by creating a core through the centre of the bale,” he says. Once wrapped, the correct storage of bales is vital to preserve and retain the quality and nutritional value of the feed. Stack bales as soon as possible after wrapping – certainly within 24 hours. Remember field-wrapped bales are particularly prone to bird damage from the moment they are wrapped. Choose a storage site away from trees and very exposed areas. The site should be well-drained, level and devoid of sharp objects. If practical, a sand base layer is recommended. Ideally, roll out a protective layer of heavy gauge polythene sheeting underneath the stack. Where necessary, protect the stack from farm animals with suitable fencing. Vermin should be discouraged by placing weather-protected bait stations around the stack perimeter. Ensure these are also protected from pets and farm animals. Once stacked, always protect from birds by applying a close woven polypropylene net. Support the net so it is not in direct contact with the surface of the bales where birds could land and reach through the net. Do not store bales near watercourses. Advice is available from your local water authority. Keep fertilisers, herbicides, mineral oils, etc. away from the stack as these can damage the film. Do not stack bales more than three high. Bales of low dry matter (heavier) should be stored in a single layer. This prevents bales at the bottom being squashed under the weight and ‘blowing’ the wrap’s seal. Regularly check bales for damage and re-seal with a UV protective tape. Always follow the machinery and wrap/film manufacturers’ instructions. Regular maintenance is also essential to equipment.